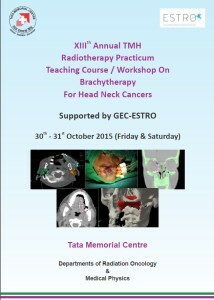 TATA Memorial Hospital (TMH), one of the leading cancer centers in the world is hosting the “Indian Edition” of the GEC-ESTRO Teaching Course for H&N brachytherapy on October 30th-31st, 2015. The course is a unique training possibility for specialists in Asian countries who are interested in learning more about H&N brachytherapy. The two-day program includes lectures and online implantation procedures. There is also the possibility of holding interactive discussions with the implanting team. The local organizer of the course is Prof. Ashwini Budrukkar from TMH and the external speakers are Prof. György Kovács from University Medical Center Schleswig-Holstein in Lübeck as well as Prof. Bengt Johansson from the Orebro Cancer Center in Sweden.